A: The product's longevity will vary depending on the surface texture type of stone, tile or grout, where it is located what type of wear is the surface exposed to, etc. Typically we recommend re-application on flooring every 1-3 years for commercial flooring and every 3-10 years for residential flooring. We recommend re-application every 1-3 years on counters and every 3-20 years on vertical surfaces. 3. Will the 511 product build up, crack, peel, or discolor? A. No. The Unique formulas allow them to penetrate and bond to the surface without bonding to itself. It is not a surface coating and therefore will not crack, peel, yellow, or discolor at any time. A. Because these products don't adversely affect most anything, they are very easy to apply. You may use a Miracle Sealant Applicator, pump up sprayer, clean towels or a light weight rayon mop. The general rule is to wet the surface so it gets very wet to your eye. Allow to stand 3-5 minutes and wipe or buff off the excess with a clean towel or carpet bonnet under a floor machine. Do not allow 511 products to dry or evaporate on the surface of a residue will appear. This residue can be removed by reactivating it with more 511 or mineral spirits and buffing immediately dry. For multiple applications, allow to dry 1-3 hours minimum before applying second application. Two applications should be sufficient in even the worst situations. 5. How toxic are 511 products? A. 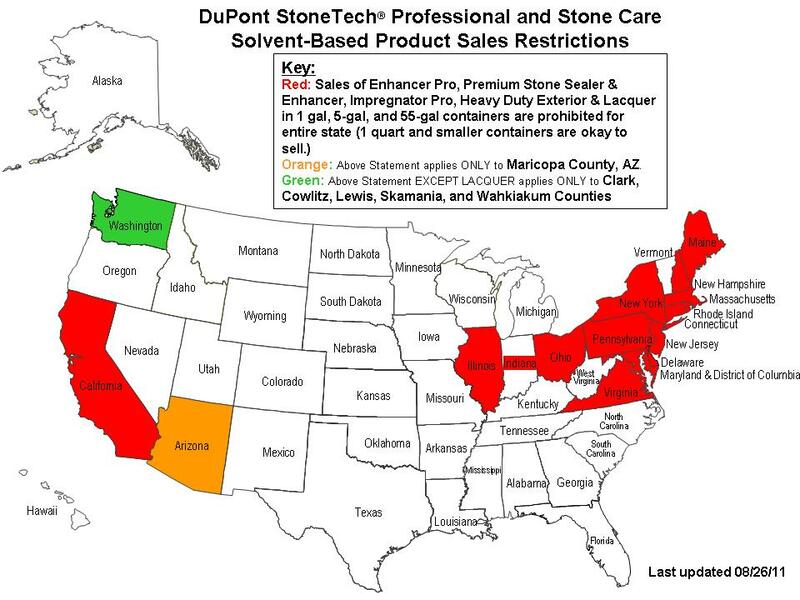 Although 511 Impregnator, Porous Plus, CST and Grout Sealer are solvents, they are only a 1 on the toxicity level (0-4). That is equal to laundry detergent. Nome of these products are considered flammable. They are combustible (more then a 100 degree flashpoint). They are solvents so you don't want to drink them moor lock yourself in a small room and start sniffling the bottle. 511 is USDA approve for used in food prep areas. 511 H2O is a O on the toxicity scale, is non-flammable and has no odor. For any area where smell or allergy is a concern the customer may use 511 H2O. 6. Will the 511 products change the look of the tile, stone our grout surface? A. Typically 511 Impregnator and 511 Porous Plus will not alter the natural look. They may have a tendency to shade the surface slightly, possibly creating a slight darkening. However, when the entire field is treated it is rarely noticeable if at all. 511 H2O will have virtually no color or shading at all. 7. What is the difference between 511 Impregnator instead of 511 Porous Plus? A. 511 Impregnator is polymerized silicone resin that will offer superior water repellency on all surfaces and superior oil repellency on most medium to dense surfaces. Because it is not a coating, it doesn't fill the deep pores of many porous surfaces. As a result some oils may be able to work their way into the surface. Often they are able to be removed, but not always easily. 511 Porous Plus is the same polymerized silicone resin but his product has an added polymer in it to keep the stain fighter closer to the surface even on very porous surfaces. This added polymer is vapor permeable, translucent and when used with the polymerized silicon resin creates a fantastic stain repellent surfae on the most porous surfaces. A. 511 Porous is not as expensive as you might think. Take a look at the coverage rates of 511 Porous Plus and look into the cost per square foot not per unit. 511 Porous Plus will achieve a performance on many substrates other products will not work on. 511 Porous Plus spreads the competition by as much as 10 to 1. 511 Porous Plus is very durable and doesn't need constant re-application. With that take into consideration the added Polymers are a very expensive component that 511Impregnator does not have. A. No! 511 Porous Plus has the added polymer and 511 Impregnator does not have it. Therefore multiple applications of 511 Impregnator will not do what 1 or 2 applications of 511 Porous Plus will do. A. A grout release is a product applied to the surfaces of the stone or tile prior to grouting. This step keeps the grout dye from penetration into the surface and allows faster grout clean up. We recommend using the product you have chosen as your surface protector, as your grout release. You don't need a specific product for a grout release. 511 Impregnator, 511 Porous Plus, CST and 511 H2O will all release grout when used properly. A. Typically this isn't a challenge because we are never flooding the surface with the 511 products. in the event a little gets into the joint it will not preclude the ground from staying in place, especial epoxy grout. Just don't pour the 511 over the surface and into the grout and you should have no difficulties. A. Allow the grout to cure per the manufacturers recommendations is best, however, for those applications that need to be sealed immediately, we recommend waiting at least one hour. 13. When do I use 511 Impregnator and when do I use 511 Porous Plus? A. Think about 511 Porous Plus for oil and grease. If the surface is going to be exposed to oil and grease then you want to consider Porous Plus. After the oil consideration we then have to look at the substrate. If it is dense then 511 Impregnator will likely achieve what they want. If the substrate if very porous then they will want to consider using 511 Porous Plus. Both can be used on any surface. Keep in mind if the main focus is water and dirt not oil and grease, 511 Impregnator will work well on most all surfaces. MS can run on a stain test using both products if they will send in two pieces of the surface. 14. I have a white haze or streaky appearance after using 511 products. A. This means they have applied too much product and allow it to dry on the surface. 511 can be reactivated by using more 511 or using mineral spirits wetting the surface and immediately buffing dry. On polished stone surface the excess may be removed by buffing with #0 or #1 steel wool. A. No. All surfaces treated will be less slippery. Howe much will vary from surface to surface and installation to installation. 16. Can 511 Porous Plus be used on polished and less absorbent surfaces? A. Yes. 511 Porous Plus will not harm any stone, tile or grout surface. In fact, due to the structure of some dense polished stone surfaces, 511 Porous Plus will be the best product for the job in many instances. 17. Will the 511 product allow the surfaces to breathe? A. Yes. Depending on the product, the speed of vapor transmission will vary. Yes. These products are effective from 65 - +400 degrees F.
A. It depends on what the products are applied to, but depth can be 1/32" to 2.5". 20. Can 511 products be used in, or around pools, spas, fountains, showers, and baths? A. Yes. These products are not surface coatings and as some are very effective products for water and stains repellency as well as enhanced anti-slip characteristics. The products are effective to approximately 2' in depth. 21. Why do 511 products spread so fast? A. Due to the small molecular structure and mild solvent carrier the 511 products spread much farther than water without sacrificing performance. 22. What will the 511 products to to surrounding surfaces? A. 511 products are user friendly and will not harm wood, metal, glass, plastic, acrylic, rubber, sponge, fabric, carpet, cloth or aping. A. Once cure it will take temperatures in excess of +900 degrees F or a very caustic solution to affect the silicone molecules. The only sure way to remove the 511 products is to home or sand the surface. A. We can't speak for the competitors but we can speak on the 511 products. Theses products have been successfully used on well more a billion square feet surfaces world wide. We have a tremendous amount of references and distribution locations. In addition, we offer more independent test data to back up specific claims on 511 products then competitors offer on its products. This test data gives you intelligent information to try the products. Ultimately, the "proof is in the pudding". 25. Does using the 511 products make the surface stain proof? A. No The 511 products will make the surface water and stain resistant. They will not stop the surface from soiling and therefore the surface will still need to be cleaned with the appropriate cleaner and technique periodically. A. Actually we con't know why anyone would need to know this. However the solids can be calculated by looking at the MSDS and seeing how much liquid ingredients are used. Grout Sealer is approximately 1.5% solids, 511 Impregnator and 511 Porous Plus are approximately 5%.6% solids. CST is approximately 10% solids and 511 H2O is approximately 20% solids. 27. Can I seal the back of the stone or tile with 511 products? A. The only way you might want to try to seal the backs would be in installations where the stone or titles are going to be hung or installed mechanically without the use of adhesive. The 511 products can act like a bond breaker and therefore the adhesive may not stick as well if the backs of the surfaces are treated. A. No. Dilution will affect their performance drastically. A. Yes. Mira Matte, Mira Shine or the Saltillo Waxes. A. It can be both ways. The typical installation would be to treat with 511 products first allow to dry 1 hours and treat with Mira Matte. This would offer good protection and good color. For the most color treat the surface with Mira Matte by itself. The stain protection won't be as good but there will be more color. Now here's the curve ball, many customers treat the surface with 511 products after treating the surface with Mira Matte. They find the surface is less slippery and more stain resistant than leaving the Mira Matte by itself. As long as the excess 511 is wiped of there is no problem with this. 31. Can Mira Matte be use on Saltillo or smooth surface? A. Yes. It is very important to remove any excess before it becomes tacky on the surface. Spread evenly over the surface and buff excess off within 3-5 minutes. 33. How do I strip Mira Matte or Mira Shine? 34. Can Mira Shine be used in exterior applications? A. No. This product is not designed for exterior use. A. Any of the Miracle Sealants cleaners depending on the surfaces. Mira Clean #1, Mira Soap, Liquid Poultice, GCFR, Stone Cleaner Preserver, Grout Cleaner, and Tile & Grout Cleaner. A. For Epoxy Grout use Epoxy Grout Film Remover. A. We suggest having a stone care professional polish the floor mechanically using the appropriate abrasive, polishing compounds and equipment. 38. I have a matte finish ceramic tile, I want it to shine. A. The only product we can recommend is Mira Shine. The customer must be aware the finish will scratch and scuff and mark. We suggest using the appropriate 511 products and simply clean the surface as necessary. A. Yes. Stone Polish. Water Ring & Etch Remover, Marble Conditioner, Mira Dust, Mira Pads, and Pyramid Diamond Abrasives. A. Yes. The color chart is in the Tile & Grout Care Tri-Fold brochure at this time. A. No. The Grout Colorant is an epoxy and will seal the grout very well. 42. What is the product's warranty? A. In the event of failure, the only obligation of Miracle Sealants will be to replace such products proven to be defective. Before using, user will determine the suitability of the product for it's intend use. (We will only replace defective products, not tile, stone, grout, etc.). 43. Where can I get 511 products? A. Through commercial tile, stone, brick, concrete, janitorial, food service and building product dealers and distributors. A. Depends. Miracle Sealant's products are sold through independent distributors and dealers throughout the world. If there is not a convenient distributor in your area MS will sell directly on a prepay or COD basis. 45. I distribute other products, why can't I buy at distributor discount levels? A. Miracle Sealants has requirements to become a distributor. These requirements haven't change in more then 11 years. This translates to a stable, consistent distribution program that breeds continuity. In most instances, when your business is willing to meet those requirements you are welcome to become a distributor. 46. What is a Chelate used in Tile & Grout Cleaners? A. The word chelate means claw. Chelates encompass or surround metallic ions, i.e., magnesium, iron, calcium, copper, nickel, zinc, rendering these ions inactive. Metallic ions have and adverse effect on color, oder clarity and stability of the finished product as well as the performance of the product at the time of application. A challenge that will occur whittle using chelate involves their usage around marble. Marble, Limestone, etc., are composed of metallic ions. The use of chelate will actually attack these ions which will degrade the surface. The result will be a highly polished marble which will dull with the use of Tile & Grout Cleaner. This is due to the calcium removal from the surface. In actuality, the surface is being etched by the chelate, similar to an acid. Washington (Clark, Cowlitz, Lewis, Skamania & Wahkiakum Counties only) California Illinois Ohio Maine New York Vermont New Hampshire Massachusetts Rhode Island Connecticut Pennsylvania New Jersey Delaware Maryland Virgina Arizona (Maricopa County only) Indiana (Effective October 1, 2011) Note: The information is furnished free of charge and based on information that DuPont believes to be generally reliable and accurate. Individual facts and circumstances may differ. It is intended for your use, at your own risk. Because conditions of use are outside our control, we make no warranties, express or implied, and assume no liability in connection with any use of this information.